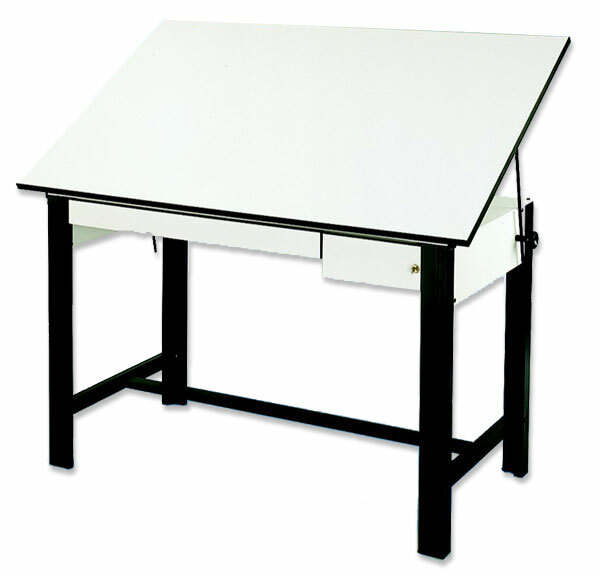 The DesignMaster is an extremely strong, durable drawing table made of 18-gauge steel tubing with legs that are welded together to form a 3" × 2" post for maximum stability and rigidity. Both the table top board and supporting panels are made of ¾" thick therma-fuse melamine. The smaller 36" × 48" table comes with one long center drawer. The larger 37½" × 60" tables come with the long center drawer and a side tool drawer (pictured). The table top board adjusts from 0 to 45 degrees. It is trimmed with bonded black vinyl edges. The tool drawer measures 3½"H × 8"W × 23"D and features a lock and ball bearing slides. The reference drawer measures 1½"H × 31"W × 23"D.
All metal parts are scratch-resistant, electrostatic powder coated. Assembly is required. Manufacturer's lifetime guarantee. Black Table, 37½" × 60"